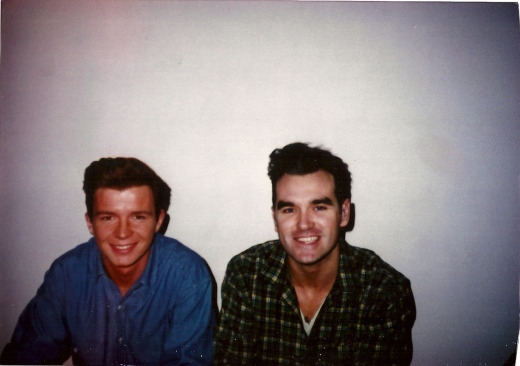 Apropos of… well, we’re not sure… Morrissey fan site True To You today posted this 21-year-old photo of Moz (smiling, no less) and future Internet meme/then-pop-star Rick Astley backstage at BBC’s “Top of the Pops,” where the two appeared following the February 1989 release of their “The Last of the Famous International Playboys” and “Hold Me In Your Arms” singles, respectively. Anyway, this one’s too much of a curiosity not to share. I admit it, I was into both Rick Astley and The Smiths/Morrissey, but I thought I’d be the only one who could stomach both of them!!!!! I’m glad you included ‘respectively’ there. I would never have guessed which was which.